So, sometimes I have crazy busy days that seem to go at Mach-10 with no breathing time. Ok, so maybe it's a little more than sometimes...say most times! And with my egg allergy and trying to avoid grain for the freaky skin, lunch can be either boring or time consuming. Today was one of those days where I needed something quick. One of the hubby's favorite snacks is cottage cheese with wheat thins, so I took a different spin on that. 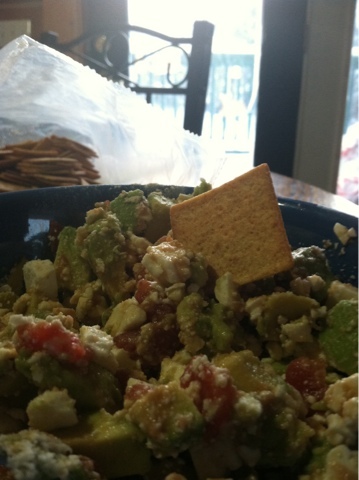 Enter the feta avocado tomato lunch. Now, this wouldn't be an everyday lunch since the fat content may be a little high (my mom is probably pulling her hair out and screaming "FAT!!!!"). Never the less, it is delicious and fast, and hopefully you enjoy it! 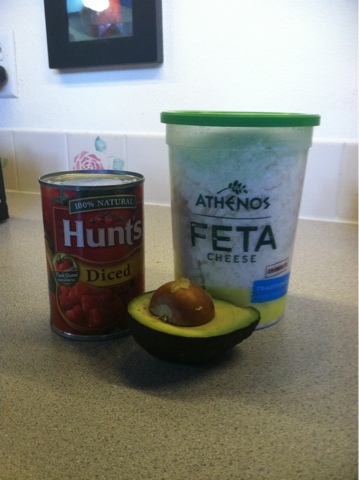 Put avocado, feta and garlic powder in a bowl. Add tomatoes until desired proportions. I put about two big scoops in. Eat with wheat thins (though they are freaky skin causing), romaine leaves, or mini peppers. Very quick and easy!